The Tour 2016 is three stages in, and so far, as expected, it’s been one for the sprinters. This is an article that I first published here in 2014, after meeting Paolo Menaspa at the European College of Sports Science Congress in Amsterdam. I publish it word for word below (in the interests of time), appreciating that the context may be slightly different, but the data is not and so hopefully it adds some value to your appreciation of the sprint finish, and in particular, the method of Mark Cavendish. What does it take to win a sprint stage in the Tour de France? A picture says a thousand words, so let’s begin the answer with a trip on a professional sprinter’s bicycle. This is John Degenkolb finishing second in Stage 1 of this year’s Tour of California (he’s beaten by Mark Cavendish, who you see first at 0:50 and then catch a glimpse of on his right at the very end). But the physiology and the power output that goes into producing that is really interesting too. Not something I’ve covered here much in the past, my focus has normally been on the mountains where the yellow jersey is won and lost. But today, and for this week, it’s about the green jersey, and the fastest men in the Tour. As luck would have it, I was chairing a session at the recent European College of Sports Sciences meeting in Amsterdam, and up to present comes Paolo Menaspa, who is studying this exact question. We discussed it afterwards, and he agreed to help me put together an explanation of some of the hidden aspects of a professional cycling sprint. So here is Paolo’s expert viewpoint (indented and dark grey if you want to read uninterrupted! ), with some comment and added explanation woven in from me. As background, the sprint is the final maximal acceleration done to reach the finish line in front of other competitors. Sprints only last a few seconds (about 10 to 15 sec) and occur at the end of relatively flat races, finishing at high speeds (>60kph) and with a fairly large number of competitors. Some may consider flat stages (sprint-stages) boring. 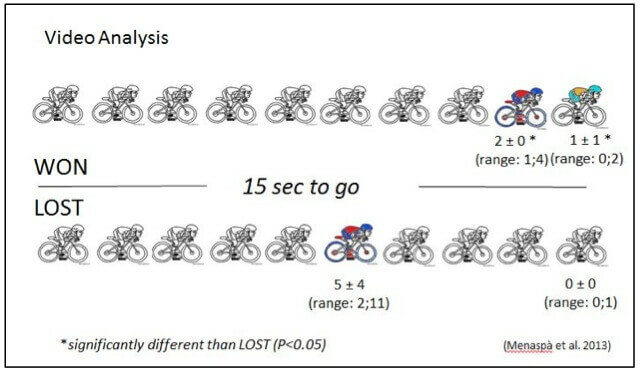 However for many, the sprint stages display the quintessence of physiological, technical and tactical display in cycling. Cyclists that specialise in the sprints are often similar to the Usain Bolts of the athletics world. Ross: This is certainly true within the professional peloton, but I’d just elaborate that a Tour de France sprinter is NOT actually as diametrically opposed to a climber or overall GC contender as say, Usain Bolt would be to Wilson Kipsang or Haile Gebrselassie, who run marathons. The pure “sprinters” of cycling are on the track, or even in BMX competitions, where the total effort is much shorter and the power outputs achieved much higher. So the noteworthy thing about a Tour de France type sprinter is that they possess the physiology of endurance athletes (you can’t escape 6 hours of cycling over mountains) but also the ability to generate enormous power outputs at the end of it. Just what kind of power outputs are we talking here? 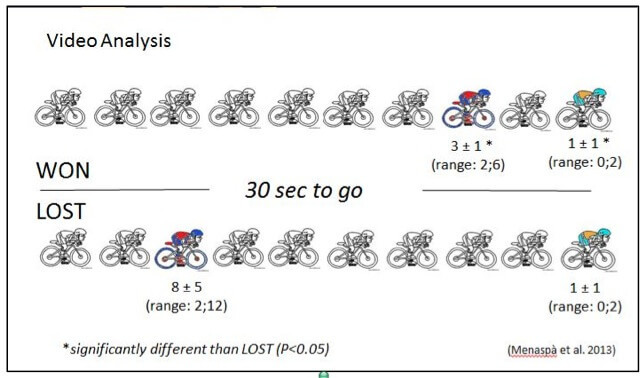 The scientific literature regarding road cycling sprinters is extremely limited. To date, only a couple of studies reported the peak and average power output in successful sprints, but only from single riders. The other 25 stages were won by 19 different sprinters (Menaspa 2013). Data indicate that the last decade there were only five reliable successful sprinters in the entire peloton. During the last 3 years my colleagues and I were able to see and analyse races files from six different professional World Tour sprinters. Their average age, height and weight were 27 yrs, 1.76 m and 72 kg, respectively. Ross: Just a word from me here – with respects to these numbers, logic dictates that a sprinter would be heavier than an overall tour contender, because the requirement for sustainable power to weight in the mountains decides the yellow jersey, whereas the sprints and green jersey are won (partly) due to absolute power, and the bigger you are, the higher that number (all things being equal). And sure enough, this is what you find. Six of the favorites for this year’s Tour de France title (Froome, Contador, Nibali, Valverde, Mollema & Talansky) have an average mass of 64.4 ± 4.1 kg, compared to 71.7 ± 1.1 kg for the six sprinters Paolo has analyzed. Height-wise, the GC guys this year are a little taller, but I wouldn’t read too much into that – Froome and Nibali are both tall, pushing the average up. We decided to include in our study only competitions in which the cyclists finished in the top five (Ross: makes sense – you want to know what success looks like, not the aborted sprints, though this would be of interest separately). The sprint peak power output was 1248±122 W (range: 989-1443 W), and the average power was 1020±77 W (865-1140 W) for a duration of 13±2 s (9.0-17.0 s). These data fall within the range of previously published data where, for example, a peak power of 1097 W and 1370±51 W were reported for won sprints. The peak speed reached during the sprints was 66.1±3.4 (57.1-70.6), slightly lower than the expected; however, the speed data were in agreement with previously published data (J Martin 2007, Menaspa 2013). 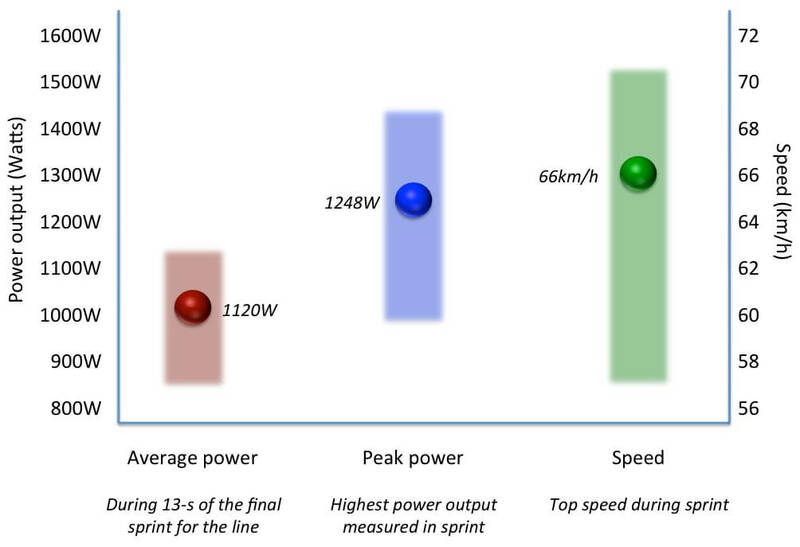 So the peak power output measured in these sprints was 1443W, and across the group, the average was 1248 W. That corresponds to between 17 and 18 W/kg, and so that is the short answer to our opening question! For comparison’s sake, when we hit the mountains, we are expecting to see the GC men win the Tour with sustained efforts of maybe 30 to 40 min in the range of 5.9 to 6.2 W/kg. For shorter duration sustained efforts, look no further than the power output file of Vincenzo Nibali’s second stage victory in Sheffield, shown below. 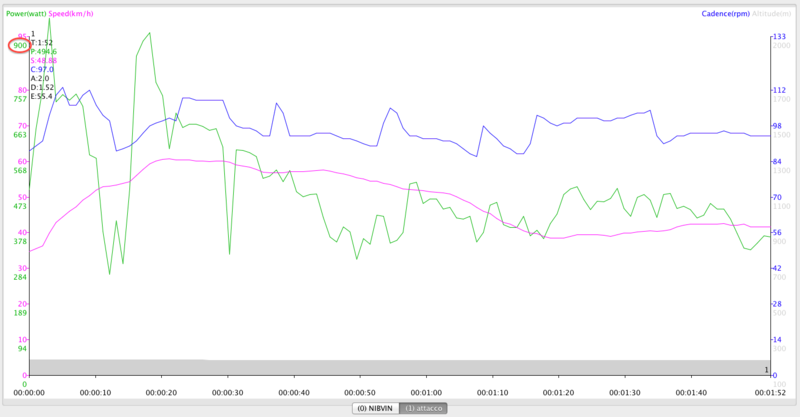 He produced an average of 495 W (7.6W/kg) over the final 2 minutes (1500m) of the stage, but the break was created with two very big (though short) efforts of over 900W, which you can see in the graph (green line is power). Incidentally, I expect Marcel Kittel, who has dominated the two contested sprints in the 2014 Tour, to produce higher absolute numbers than the numbers for sprinters shown above, purely because of his size (82kg on the Tour website profile), and so at 18W/kg, he would be pushing 1476W. A note also on fatigue effects – these numbers are produced after 150 to 200km of racing, so do not represent a true peak for each rider. Paolo informed me that they would probably be 10 to 15% higher (so 1600 to 1700 W) in a fresh, non-fatigued state, though this has not been documented in this group. Those “pure sprinters” I mentioned earlier, from the track, would probably be touching or even exceeding 2000 W, but as mentioned, a professional road cyclist sprinter is riding 5 hours and then delivering maybe 90% of their peak power output, combining aspects of endurance and explosive power. However, there’s more to the story than the power, and this is where it gets interesting. The race winner is NOT necessarily the man who produces the highest power output, because the sprint is a complex event, where tactics and aerodynamic factors can play a crucial role. There are several factors that can explain this. Sprinters with different aerodynamics reach different speeds for the same power output. Of course the aerodynamic characteristics depend on the cyclist’s size (height and body mass) and the shape of the moving ensemble: bike, cyclist and equipment. In aerodynamics there is an element that consider all these factors and summarise them into a single number. It’s called CdA (coefficient of drag area) and, to put it in practical terms, the lower the better. To give some reference data, Eddy Mercx’s position for the 1972 hour record had an estimated CdA of 0.262. A normal road bike with road helmet and cyclist riding with hands on the drops has a CdA of approximately 0.300. The sprint position is slightly less studied (especially if compared with time trial positions), also because when you sprint out of the saddle the position changes continually. However, unpublished wind tunnel data demonstrate a reduction in the CdA from ~0.295 for a traditional out of the saddle sprint position to ~0.260 for a more aerodynamic position. Ross: One of the best proponents of this, and the best way to illustrate it, is Mark Cavendish – see the pictures below. Cavendish in the bottom row, whereas team-mate Mark Renshaw is the top row, with high shoulders. 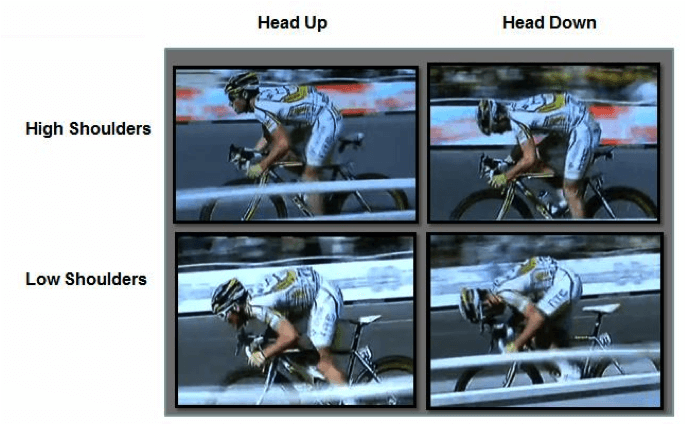 The “Cavendish” position: low shoulder and head down (David Martin, personal communication) is one of the more aerodynamic positions during a sprint. Because of the extremely high speeds reached by sprint cyclist and the very small winning margins, the aerodynamic shape of the sprint cyclist can be extremely important. In practical terms, such a reduction in CdA (~10%) can result in more than three metres advantage over a 14 seconds sprint. Based solely on these data, it becomes obvious why there were no correlations between absolute power (Watts) and race results. Tactical variables may be as important as, or even more important than, power alone. A recent case study showed that a good position in the bunch and team support are important factors for road sprint performances (Menaspa 2013). In particular, video analysis revealed that in successful sprints the sprinter was in 6th (±2) position with one minute to go (i.e. around the last km mark), while he was in 9th (±5) position in sprints in which he ended in the top 10 (but not top 5). With 30 seconds to go (i.e. about 500 m to the finish line) the sprinter was 3rd (±1) when he won, while he was in 8th (±5) when he didn’t win. It’s also interesting to look at the whole range of data (unpublished). In fact not a single victory was obtained when the sprinter was further back than 9th position with one minute to go. Similarly, no sprints were won if the sprinter wasn’t in the top 6 at 30 sec to go. 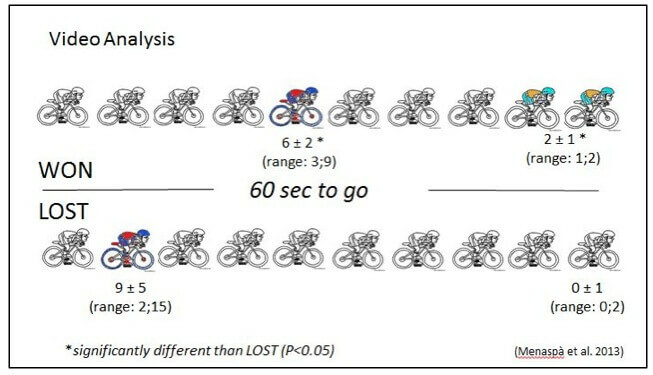 The same research investigated the team support, evaluated by the number of teammates in front of the sprinter. Interestingly, the number of team mates was higher in successful sprints, when compared to sprints in which the sprinter didn’t win. The ideal scenario seems to be two teammates with one minute to go, and one from the last 30 sec till the start of the sprint (roughly 15s to go). There are some hypotheses that could explain why team support may be significantly helpful. For example, it guarantees a good position without having to fight for it. Also, a good lead-out train seems to facilitate the last kilometres of competition with a smooth ride, compared to a more stochastic ride for sprinters that have to find their way in the bunch alone (Ross: “stochastic” basically means the variable effort that you’d need to jump onto a wheel, sprint to close a gap etc – all of which costs energy that probably reduces the power output in that final 15 s sprint). So, in this data set anyway, if you aren’t in the Top 9 with a minute of the race left, and then in the Top 6 with 30 seconds left, you aren’t going to win the sprint. Of course these results and conclusions may not apply to other sprinters, or to all the sprints. Among other things, the number and performance level of the competitors play a major role in the importance of good positioning. 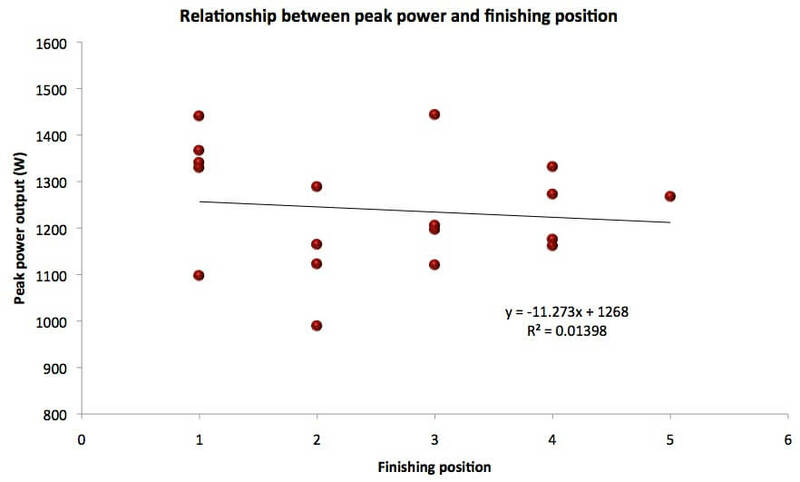 The main limitation of the presented data set, with regard to this specific analysis, is that power data were recorded from different sprinters during different competitions. For future studies it would be interesting to compare files from several sprinters competing against each other in the same sprint. In that case it will be possible to better understand what the determinants of successful sprint performances are. The sprint cyclists are a unique and exciting component of the Tour de France. Not only do the sprinters boast some of the highest peak cycling power outputs in the peloton but they also display tremendous courage and tenacity as they jockey for ideal position leading into the final sprint. The winning sprint appears to be the combination of well executed tactics combined with outstanding physiology and aerodynamics. So that’s an overview of the power output, aerodynamics and tactics in a professional sprint, which you can expect to see more of in coming weeks. Paolo informs me that there are likely seven stages ideally suited to the sprinters, and we’ve seen two. I’d like to thank Paolo for taking the time to produce a translation of his research. He is currently studying at the Australian Institute of Sport (AIS) as an Edith Cowan University PhD scholar. If you’d like to know more, then please contact him either at his Edith Cowan University site, or follow him and make contact via Twitter. Also, I’d like to use this opportunity to invite anyone else who has interesting insights on the Science of Cycling to contact me to submit articles, and I’ll use them like I’ve done with Paolo in this article. So if you have a contribution, don’t hold onto it, let’s carry on the discussion!